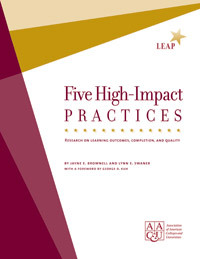 This publication presents findings from a national study conducted by AAC&U researchers to investigate the impact of engagement in high-impact practices on traditionally underserved populations (defined here as first-generation, minority, transfer, and low-income students).The mixed-method analysis includes student-level data on engaged learning at thirty-eight participating institutions-from the state higher education systems in California, Oregon, and Wisconsin-drawn from the National Survey of Student Engagement (NSSE), as well as qualitative data obtained through student focus groups held at nine selected campuses. This report serves as a guide for campus-based inquiry to further our understanding of underserved student engagement with high-impact practices. The publication also includes a toolkit on assessing equity in high-impact practices developed by the Center for Urban Education at the University of Southern California. 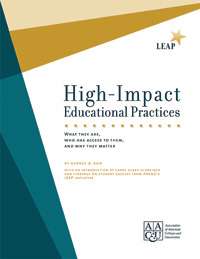 This report is available for free online at www.aacu.org/assessinghips/. 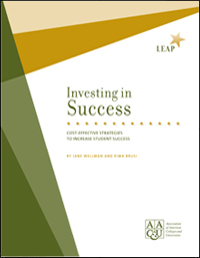 Copies of this free publication are limited to one per person. Raising the quantity will not increase the number we can ship to you. It will only increase the postage you will be charged. Please check your final order to make sure it is for one copy only. Thank you.